A presidential election has taken place in the West African state of Burkina Faso, with incumbent Blaise Compaore the favourite to beat 11 opponents. Queues formed peacefully as 12,000 polling stations opened for the four million registered voters. Analysts say the opposition to Mr Compaore, who came to power in a bloody coup in 1987, is very divided, with no single dominating figure emerging. Burkina Faso is one of the poorest and least developed countries in the world. The election result is not expected for a few days. The winner will be elected for five years. If no candidate gains an outright majority, the top two must fight a second round. Two recent opinion polls suggested 60% of voters intended to back Mr Compaore. Voter-education campaigns urged everyone to vote, calling it a civic duty. 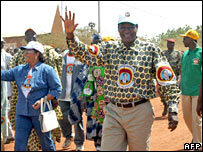 Mr Compaore was the only candidate in the 1991 elections and most of the major opposition figures did not run in 1998. The Constitutional Court allowed the president to run for office again, even though an amendment to the constitution made in 2000 limits each head of state to two terms of office. His rivals this time have denounced what they see as an uneven playing field. President Compaore has spent hundreds of thousands, perhaps even millions of dollars more on his campaign than his rivals, our correspondent says. They also fear the vote will be rigged. About 1,000 foreign observers were at the polls. The opposition candidates have attacked Burkina Faso's alleged involvement in several wars in the region, and say they will cut down on corruption. However, his supporters argue that his real advantage is that the opposition is so divided.